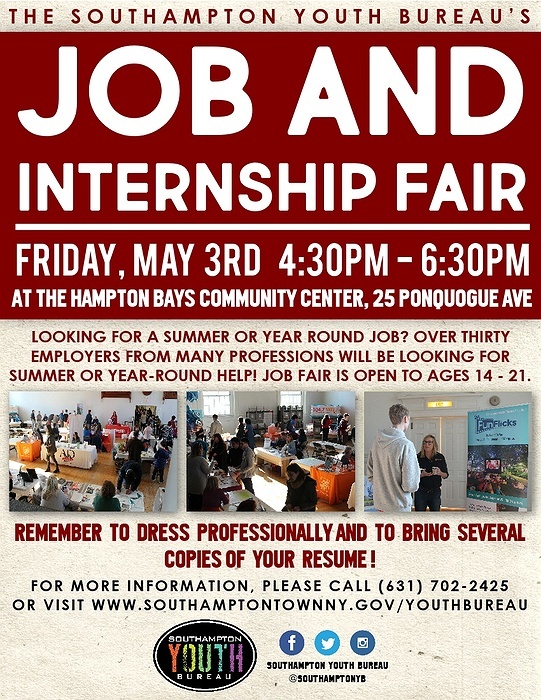 Subject: LongIsland.com - Your Name sent you Event details of "Job & Internship Fair"
The Southampton Youth Bureau will be hosting a job and internship fair for young people between the ages of 14 and 21. Over thirty local employers from many professions will be looking to hire for summer or year round jobs. Career opportunities are also available. Bring your resume, a nice suit, and don’t forget your smile. Jobs in many different fields will be represented. For more information, please call (631) 702-2425 or visit www.southamptontownny.gov/youthbureau.